Anastasios the owner was extremely helpful and very accommodating with our request for a toaster and hair dryer. Also helpful with hints regarding the island and sites that are a must see. On our departure date there was a ferry strike, we stayed an extra night at no cost !!! I found the apartment everything just right for me good location kept in really good condion. the location of the apartments was ideal 10yards to the main street with plenty of tavernas and bars just a short walk to a pebble beach that had the clearest of waters quite low key but a lovely place.. The location is excellent right next to all the local shops and restaurants! Everything was clean. Fresh towels and sheets every 3 days. Close to the town and beach. Couldn’t have asked for anything else. Would definitely return and recommend. Very clean and spacious apartment, Good location in the centre with easy access to bars and restaurants. 5 minute walk to the beach. Well kitted out, proper oven and fridge, air-con. Bins emptied every day. Room facilities were excellent. Very friendly staff. Lock in a great price for Ionion Apartments – rated 9 by recent guests! Offering free WiFi and a terrace, Ionion Apartments are located in Skala Kefalonias, 1,000 feet from Skala Beach. Opening to a terrace or balcony, each apartment features a fully equipped kitchen. Kefalonia Airport is 16 mi away. This property also has one of the top-rated locations in Skala! Guests are happier about it compared to other properties in the area. When would you like to stay at Ionion Apartments? This apartment is set on the 1st floor. This apartment features a balcony and air conditioning. It is set on the 2nd floor. This apartment features a terrace, air conditioning and dining area. The village has been built in the mid-1950s but our property is a 1990s creation with an interesting design by a local architect, spacious and comfortable. It was built by my father a seasoned merchant navy captain who has travelled the world. The surroundings offer numerous amenities and options for a pleasant stay including the beautiful scenery and several sandy beaches.We are offering relaxing budget family holidays in a truly comfortable and friendly environment. Showing respect for tradition IONION APTS is the ideal destination for long stay summer holidays. I am a researcher in physics and combining both jobs is always a challenge. In the summer I spend time looking after the hotel and love to care for our olive, vines and orange orchards: a born naturalist. 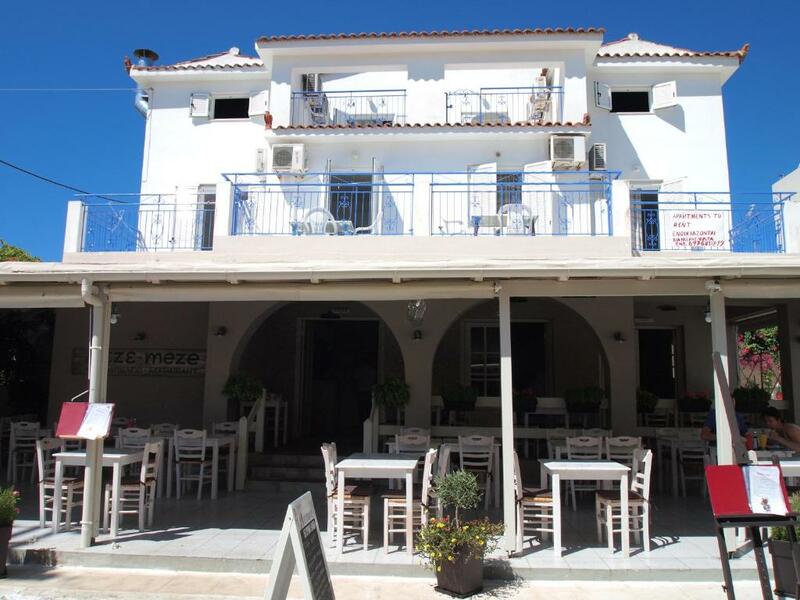 The property is situated, just off the main street, at the centre of the village very close to restaurants, bars, banks, public services, supermarkets, shops, coffee bars and pharmacies.You can take a short walk down the main street all the way to the piazza and the seafront. House Rules Ionion Apartments takes special requests – add in the next step! Ionion Apartments accepts these cards and reserves the right to temporarily hold an amount prior to arrival. Please inform Ionion Apartments of your expected arrival time in advance. You can use the Special Requests box when booking, or contact the property directly using the contact details in your confirmation. I would have liked a TV only because I am from Greek heritage. The shower was inadequate we had to treat the bathroom like a wet room as the shower, shower tray and curtain not spacious enough so water would flow into bathroom through the drain. As the single bed room was larger we decided to put beds together but use this room for more space. One of the single beds very noisy when you moved rendering it unusable. This said we had a brilliant time in Scala. The lady who met me did not speak English but i met owner very nice man god English i would have liked a Tv in room i would highly recommend these apartments. They need to look into the ant problem they have in the bathroom behind the door. The way we were greeted for the payment wasn’t in the most professional manner before leaving. Provision of a sink plug in the bathroom would have been an improvement and the toilet paper bin hadn't been emptied on our arrival. The shower was tiny and the water sprayed sideways so that the bathroom flooded with every shower. Aircon in the bedroom was faulty. The hosts speak only Russian so reporting problems or asking for a late checkout was impossible..we did try! The air conditioning in the bedroom was noisy. The shower head sprayed out in all directions. Staff was lovely and helpful (specially the cleaning lady), but at reception didn't seem to be anybody for a couple of days. So we had to finally ask the cleaning lady, she helped us out but her English was not too good. WiFi works but come and goes a lot, which is frustrating. Apart from that I'd give this place a 10 out of 10. Apartment with a perfect location to the centre and 5min walking to a great beach. I'd give a 10 for cleaning, cooker/oven, kettle and accessories were new and really clean. The common areas of the building and apartments look freshly new decorated. Area seems really safe.